The new "BEST" in .30-size helicopters. A decade ago, few modelers were willing to give helicopters a try. 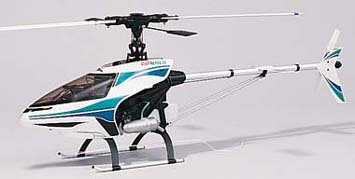 Then in 1988 Kyosho introduced the Concept 30 - whose revolutionary easy assembly and durability soon made helis a common sight. And now you'll be seeing even more R/C helis at flying fields everywhere. The reason is simple: Nexus. Compared to the breakthrough Concept, the Kyosho Nexus takes huge leaps forward in hassle-free performance. It's a completely new design - from the repositioned engine for easier starting and maintenance, to the strengthened rotor head (which also improves aerobatics). Nexus already comes equipped with many top-drawer features, such as autorotation capability, that would require upgrades in other machines. So it's more than "just" a better helicopter...it's also a better bargain. Nexus positions the engine farther forward than most helis, at a slight 15° angle. It's instantly accessible from the top of the model with an electric starter. No special start shafts or adapters are necessary. Not only does the 240cc Nexus fuel tank increase capacity for longer flight times-it's also positioned near the center of gravity where changing fuel levels won't affect flight performance, and is easily visible for monitoring fuel level. Usually an extra-cost accessory, the Nexus includes an adjustable muffler with O-Ring seal. Kyosho engineers increased the mast height and moved the engine, gyro and fuel tank locations closer to the model's center. As a result, the Nexus has a lower center of gravity for optimum flight stability. Taking the engine out for maintenance requires extremely little effort. In the improved Nexus design, the modeler simply removes four screws. No disassembly is necessary. Many fliers eventually add a rotor head button to their models-it's a safe, convenient way to stop the rotor blades from spinning. Of course, the Kyosho Nexus already includes one. For the Nexus, Kyosho used the Concept 30 SR-X's proven tail design but added two more bearings to the tail gear case. The end result: exceptional tail control and stability. Overall, the Nexus heli's rotor head uses stronger, fewer parts for increased durability and lower maintenance. One-piece blade grips, solid axle and 4mm blade bolts are examples. INTRODUCING THE NEW HAWK SPORT, featuring 31 Ball Bearing, the new GREAT Beginner Helicopter. It is easy to build and can be assembled and almost ready to fly in less than 3 hours. Main mechanics, rotor head and tail gear box are already assembled. Even the push rods are pre-assembled. Although it is a great beginner helicopter, it is still very 3D capable. This is truly a new breed of a beginner helicopter. Once again Century has re-defined the R/C helicopter industry with a quality helicopter of exceptional value and at a very affordable low price. Strong, rigid, frames molded from fiber-filled poly-composite. Modular servo, upper and lower frame design for easy maintenace. Clutch, clutch bell and fan all mounted with bearings to the engine crankshaft requires no alignment and provides the ultimate in dependability. Top hex start system that disengages after engine start up insures vibration free running. Large 10oz fuel tank for longer engine runs. Efficient cooling shroud that completely covers engine cooling fins. Includes high performance speed torpedo muffler. Strong crash resistant polyethylene plastic canopy with attractive decals. Dual tail boom supports insures no flexing during hard T/R commands. High profile landing gear protects the tail rotor. Flybar paddles with adjustable flybar weights. Aerotech 550mm, pre-built, multi-laminated covered and balanced main rotor blades. Metal control balls on all servo wheels, bellcranks, control arms and swashplates. Dual ball bearing supported collective control arm. No-slop metal composite swashplate with metal ball joints. Tail boom with keyed slots and holes insures proper alignment. 2mm drive wire in tube design with no possibility of whipping. Torque tube drive system available as an option. Double ball bearing control slider and rigid fiber filled tail rotor blades. Airfoil shaped vertical and horizontal fins. H/D nylon tail rotor gears for strength and smoothness.